Because its 2:30am and this will probably be the only time I get this weekend to write. – Graduate school application is complete and on its way to review. I think I’ve met and in most cases exceeded the requirements so fingers crossed things will go without a hitch and I’ll be signing entrance papers by the end of the month. – Had my first “Drinking Party” in ages with coworkers. VERY fun. Tried to get through all 12 varieties of umeshu… managed through 6… no hangover. Good enough. – Getting to see Lulu and Nay next week! – Getting to see Khea and get false eyelash tips Sunday! – Invitation to “amazing” brunch on the Air Force Base by Bryn! – Doing make-up and wearing at least one accesory to work this week. – In general, enjoying work. – Crap morning and evening Tokyo commute. No Salaryman I don’t want to smell all beer and shochu you drank last night. – Sakura is going through a major Daddy phase, so I’m feeling left out. 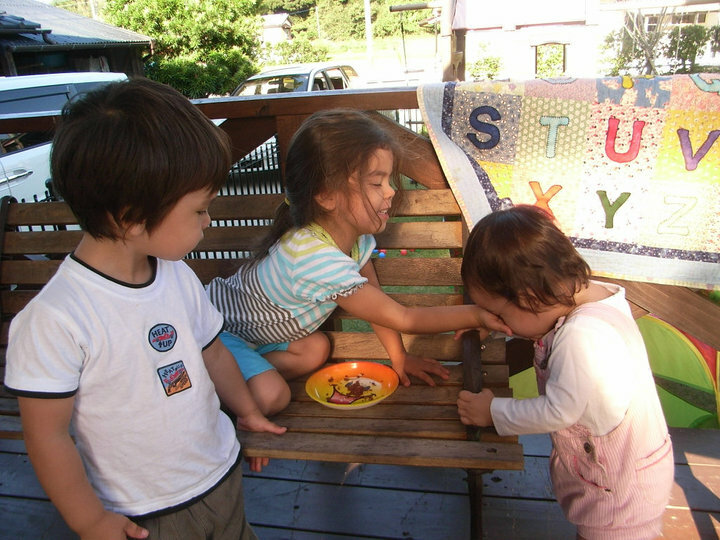 Just got back from 4 days, 3 nights with Gaijin Wife and co in Kyushu!!! Wow that trip went by super super fast…. Here are some pictures from the trip!! 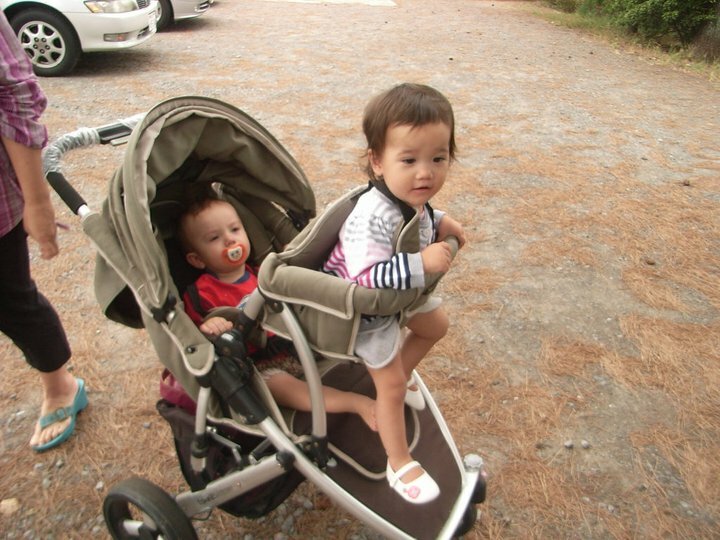 Using the awesome double buggy as a “wagon of love” for Sakura and R-kun! 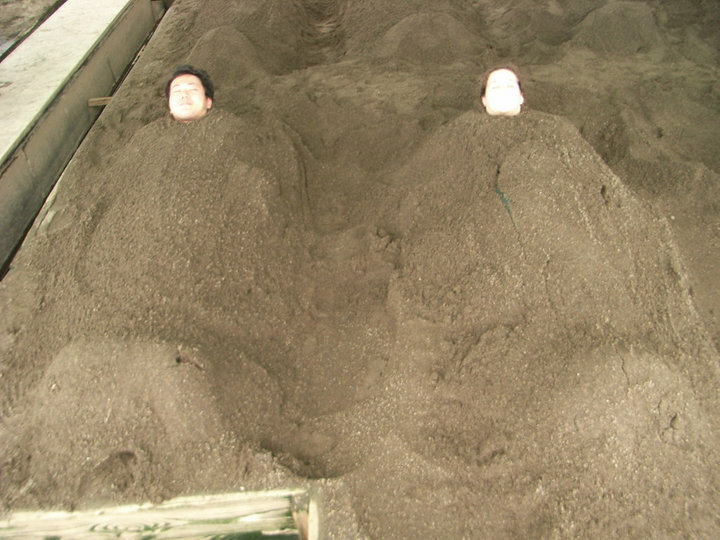 Enjoying the famous “sand bath” in Beppu!!! It was nice for the first 15mins but the last 5 were HELL.. I was dying to get out…. Book club with M-chan and R-kun! 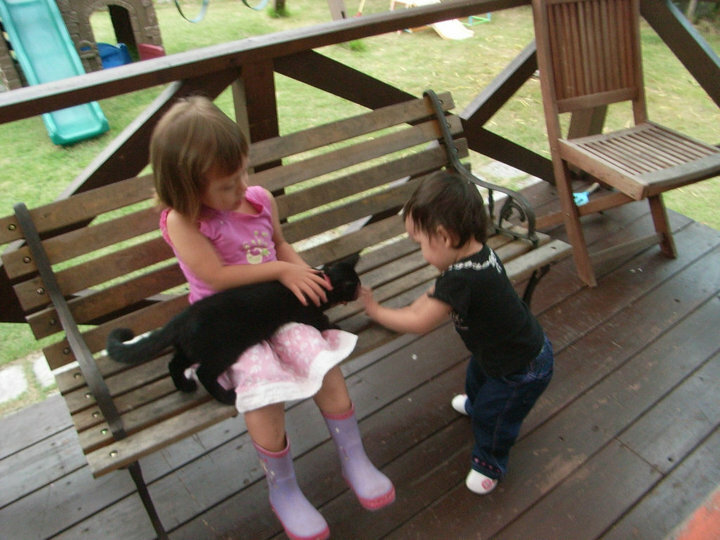 Sakura happily allowing herself to be fed by Illahee’s S-chan and T-kun when they came all the way out 3 hours to visit for the afternoon! 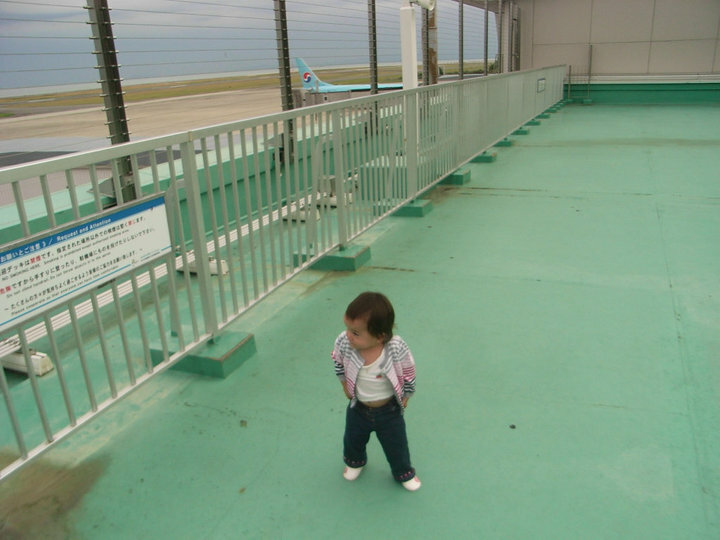 Sakura walking around like some sort of 1 year old yankee child at the airport before we left! We had a great time filled with LOTS and LOTS of action. Let me say that if you read GW’s blog it is ALL TRUE! 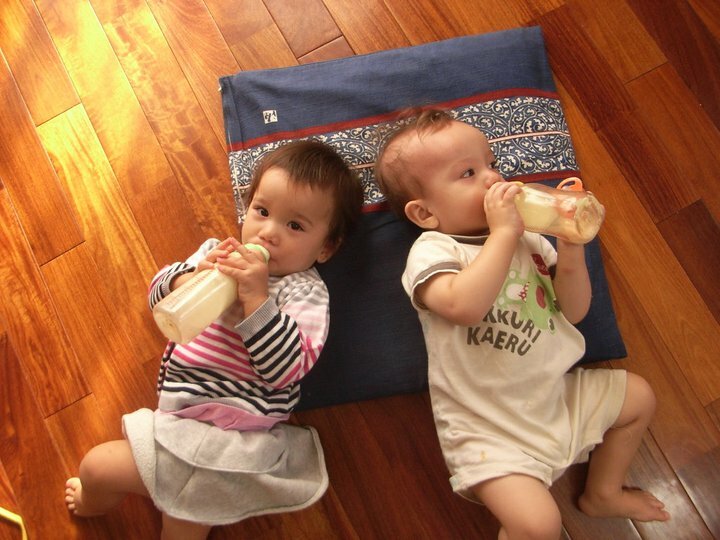 hahah… And GW is awesome and full of genki despite running a very very busy household. The “Dads” agreed to watch the 4 kids for us last night so went to a ghetto inaka karaoke box and had beer/chu-his and even got buzzed enough to pull out a random selection of j-pop to classic 80s to britney spears music… thank god no videos from that. Also wanted to thank Illahee for making it all the way out with her three kids – it was great to meet her!! I really really enjoyed my first trip to kyushu… I hope one day I will be able to make it back again. I had my first day at work today. I’m REALLY tired (and it’s only 8pm!) but I thought that some of you guys would be interested in how things went. As I said before, I work in a Japanese University as one of their English language program assistants. There is one other lady who is my “supervisor”/partner. She joined about a year ago – she’s nice and listened to all my questions. 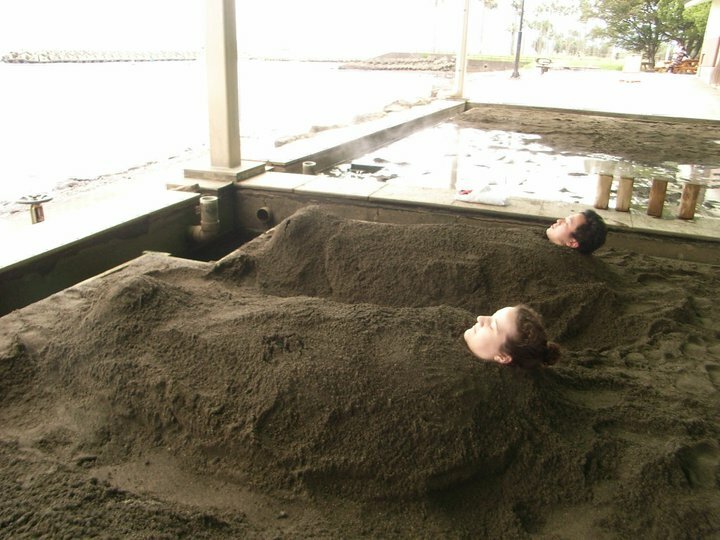 Actually everyone in my office seems pretty relaxed/nice. A few of them speak a bit of English (more so than the people in my last workplace) so occasionally they will speak with me that way – which can be a nice break from a workday entirely in Japanese. I already had a couple of assignments to complete… simple translation and some native checking. Tomorrow we will start working with the students. To be honest I’m not sure really want to expect, but so far it seems like a pretty good work environment. I think I’ll probably gain a lot of good experience as well. The only thing that was hard was remembering and missing Sakura throughout the day. I still miss her a lot, but apparently she had a better day at kindy today. However, I picked her up at 6 and she was in bed by 8… so my time with my little girl is much much less than before. I’m trying to make every minute of it count but its hard since theres dinner to made and baths to be taken etc etc. Besides Sakura though, it was nice to be back at work. To feel like I was being productive again… it was probably a good move for me to get back into the workforce AND apparently I may even have international business trips (mainly to Asia) for 3-4 days next year. They have “seminars” on the program in countries like Thailand, Korea, Taiwan, and China… so its possible they will have me go along instead of hiring a translator… crazy huh? I’m sure that I’ll have more to say as I continue working, but for now I’m 75% happy with my choice.. the other 25% being guilt and sadness about Sakura being in kindy… maybe that will slowly go away tho… we will see.